The new generation of horseplayers is probably not familiar Silky Sullivan -- the greatest come-from-behind horse of all time. I've always been a lover of a come-from-behind horse. Zenyatta is the first to come to mind, as she would settle way back behind the field and mow them all down after looking hopelessly beaten. Racing's "Queen" lost only one race, and by a short head, following 19 straight victories. The new generation of horseplayers is probably not as familiar with Silky Sullivan. In the late 1950s, this household name was synonymous with winning a losing battle. Silky Sullivan was, by far, the greatest come-from-behind horse of all time. 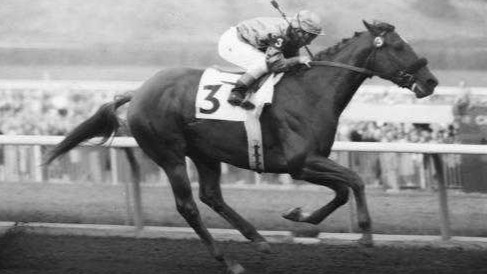 Silky, often ridden by the great Bill Shoemaker, was nicknamed Mr. Heart Attack, and for good reason. This horse didn't just come from the clouds, he came from another planet! I've heard many stories of old timers who tore up their betting tickets while watching the horse hopelessly left behind, only to go through the garbage and try to tape together their winning slips. In 1957, Silly won the Golden Gate Futurity, easily making up 27 lengths on the field. In a race at Santa Anita in 1958, Silky took back some 41 lengths off the leaders and passed them all to win by open lengths in a 6-1/2-furlong sprint! What's even more amazing is he ran the last quarter-mile of that race in 22 seconds. Later on in his career, he would come from 32 lengths out of it to score handily in The California Breeders' Champion Stakes. <a href="https://www.youtube.com/watch?v=UrSYJWK_8lg" class="embedly-card" data-card-width="100%" data-card-controls="1">Embedded content: https://www.youtube.com/watch?v=UrSYJWK_8lg</a> Silky Sullivan was a legend and a folk hero. He had his own train to travel, received Christmas and birthday cards and had his own secretary to open and respond to his mail. He was also a gentleman. He would let children walk underneath him, sit on his back and stroke the white star on his forehead. When an adult would try any of this, Silky would gently but firmly remove them from the area. Silky Sullivan was foaled on St. Patrick's Day in 1955 and raced through his four-year-old season. Beginning in 1965, he was paraded at Golden Gate Fields every year on his birthday. He was also shown at the Santa Anita Derby every year. At the ripe old age of 20, he was still being shown at racetracks across the country, and he loved every minute of it. While his two- and three-year old seasons were decent, he didn't fire in big races like the Kentucky Derby or Preakness. His career ended with a record of 12 wins from 27 starts, with one second place finish and five thirds. Silky earned $157,700 in his lifetime. Silky died in his sleep, in Pleasanton, California, on November 18, 1977, at the age of 22. He was buried in the infield at Golden Gate Park, just to the left of the tote board. Only one other horse -- Lost In The Fog -- is buried at that track. What Silky Sullivan gave a generation was priceless. He provided thrills and chills and pure excitement. He took people’s problems away for a few minutes every time he ran and showed us no matter how bad things are, there is still always hope. His name is still used today in sports and politics – when a person or team is so far behind they cannot possibly win and yet they still do, it’s called a Silky Sullivan Finish. We could all use a bit of Silky Sullivan in our lives.